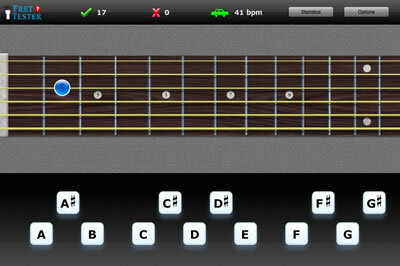 Fret Tester: Our New Online Fretboard Trainer! The first game I created was Tab Warrior, probably the worst game ever created. Second I wrote Note Fish, which is still a valuable and fun game (My oldest two sons love it!). Then I created Fret Tester, some 5 years ago! After releasing Fret Tester for iPhone just this last June, I thought it was about time I redid it. Combined Guitar Flash Cards, Fret Tester, and Fret Tester Bass into one game. I’m sure there are one or two more, but you get the idea. For those of you who may miss our old friends Guitar Flash Cards, Fret Tester Bass, and the original Fret Tester they’ll still be available. Have fun! This entry was posted on Friday, August 5th, 2011 at 4:34 pm	and is filed under News. You can follow any responses to this entry through the RSS 2.0 feed. You can leave a response, or trackback from your own site.